Life, death, dreams and rebellion… The French have always been extraordinarily talented in defying the mainstream Western cultures’ accepted notions on these. The last time the French were truly successful at jarring our sense of what is good – life, what is evil – human mortality, was done through New Wave cinema with the likes of Jean Luc Godard and Francois Truffaut. James Marsh’s new documentary, Man on Wire, combines the best of that era: Godard’s Breathless, and Truffaut’s 400 Blows, with a touch of Camus. For the post-911 world inhabitant, it is a foreign time, where breaking into buildings, i.e. the World Trade Center towers, and mocking death was an act of art, not an act of terrorism. The subject of Marsh’s masterpiece, Philippe Petit, is not your typical Frenchman, just smoking cigarettes and drinking Bordeaux and cursing the meaninglessness of life at a sidewalk cafe. He is a reckless high-wire walker taunting death on a daily basis. His goal: To walk on a wire suspended between the North and South towers of the World Trade Centers shortly after they are built in 1974. The film doesn’t quite explain how Petit grows up to have the luxury of just walking on wires in his backyard and dreaming of scaling large, prominent buildings, and it really doesn’t have to. This story originates in France, after all, and we must start with a romance. Petit pursues a shy 20-year-old, Annie Allix, and she immediately becomes his number one fan and supporter of reckless acts. 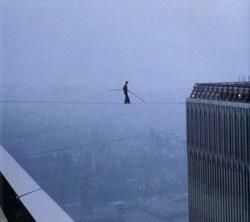 By 1971, Petit gets his first grandiose idea: To walk on a wire between the towers of the Notre Dame Cathedral. He sees it not as trespassing on the holy, rather describes himself as “a poet conquering beautiful stages.” The footage is simply breathtaking, even for those who have never been a fan of circus acts. There is a deep philosophical sense about Petit’s act. Somehow, it is not about the ridiculousness of a young man risking his life publicly. He is making a statement. The team travels back and forth between New York and France. They spy on the World Trade Center towers, disguise themselves to get information, set up a “training camp” in a meadow in France. By all modern classifications, they must be terrorists. The day of the act, affectionately nicknamed “Le Coup” by Petit, they sneak in the buildings with fake IDs. Everybody is terrified, everyone is convinced they will get busted and end up in jail or deported. But after more than 12 hours, in the early morning hours of Aug. 7, 1974, Petit manages to get on his wire between WTC North and South towers. He walks back and forth for 45 minutes, making the crossing eight times. Sgt. Charles Daniels, one of the two Port Authority police officers on the scene describes him as a “tight rope dancer because you couldn’t call him a walker.” Petit keeps walking back and forth smiling at the police, taunting them, only agreeing to step off after being told that he will be plucked by a helicopter. Everyone, including the authorities, is mesmerized. “I personally thought I was seeing something I would never see again, once in a lifetime thing,” Daniels tells the local press. The footage of this crazy little Frenchman kneeling on a wire in between the two World Trade Centers is one of the most haunting images one will ever see on the big screen. The images of Petit on top of the Notre Dame Cathedral and the bridge in Sydney are powerful, too, but because of our collective history in the 21st century, it becomes something else. It makes the viewer wonder what happened to us as a human race. When did we get from that to this in less than 30 years? But perhaps, it is best to not think of this film in the context of recent history at all and to stick with Petit’s philosophy, “Why? There is no why.” Modern life is both beautiful and terrifying, and we’d be better off just accepting that. Man on Wire will help anyone come to terms with the absurdity of our existence on this planet.